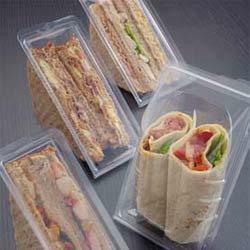 We offer a wide range of PVC Sandwich Trays to our clients. We make use of quality raw material to manufacture these Sandwich trays thus making sure that nutrition and freshness of the snack items remain intact for a longer period of time. Backed by industry experience of 26 years, we havebeen successful in establishing ourselves as a prominent manufacturer, supplier, exporter and wholesaler of Packaging Items and Thermoforming Machines. The different products included in our range are Vacuum Formed Packs, Chocolate Moulds,Clamshells, Blisters and Thermoforming Machines. Our quality range of products is highly recognized and appreciated by the clients for its optimum performance and durability. We have a perfect infrastructure set up in Thane (Maharashtra, India), which is well-suited for the production of two completely diversified lines of products. We have elaborate manufacturing facilities along with quality testing unit and well-developed R&D and warehousing sections. Together with a team of experts, the infrastructure helps us deliver flawless products to our valued clients spread all across the Indian Subcontinent and stand apart from our competitors in terms of attaining complete client satisfaction.